6.61 x 6.69 x 8.90 inch Net Weight 2.51 kg (5.53 lbs) Power Suply Unit 120W, 100-240V AC, 50/60Hz Fan System: 1 x 12 mm Operating Temperature & Relative Humidity 0 to 40˚C (32 to 104˚F), 5 to 95% non-condensing, wet-bulb 27˚C (80.6˚F) Security Slot Kensington security slot Note: Use only QNAP memory modules to maintain system performance and stability. For NAS devices with more than one memory slot, use QNAP modules with identical specifications. Warning: Using unsupported modules may degrade performance, cause errors, or prevent the operating system from starting. 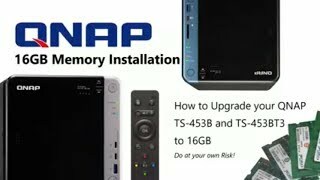 Read more about Qnap TS-453BT3-8G auto tiering. If you buy this Qnap Desktop NAS 10GbE+TB3 and hard drives we do free build and test for the unit and hard drives. So you can use this device straight out of the box. All free of charge in TS-453BT3-8G price. Why is the maximum transfer speed of the TS-453BT3 specified relatively low? Even If I use all SSDs. If you need more speed - need to choose something with more drives. Either 10gb solution from Synology ds1817 or bigger TB3 models from Qnap like x82T or x82T3 series. Some 10GB / 20GB/ 40GB options would be faster than this model thunderbolt and would be future proofing like ds1817 (with ds1817 you can get 2000MB/s). If you use MAC- 10GB adapter would be pricey but for PC its jus 100GBP. Hello I try to send a mail to sale@span.com but it said it doesnt exists or somethings wrong with the mail. hello I want to buy a NAS but I dont really know if its worth to buy the TS-453bt3 or the ts-453b. We are a big family so in the worst case 25 people are going to be connected at the same time to the NAS watching photos or movies or just saving things. In the future Im going to buy some security cams and using it with the NAS. another question about the price of the ts-453bt3 do you have an approximate? When the ts-453bt3 is available are you going to lower the price of the ts-453b?